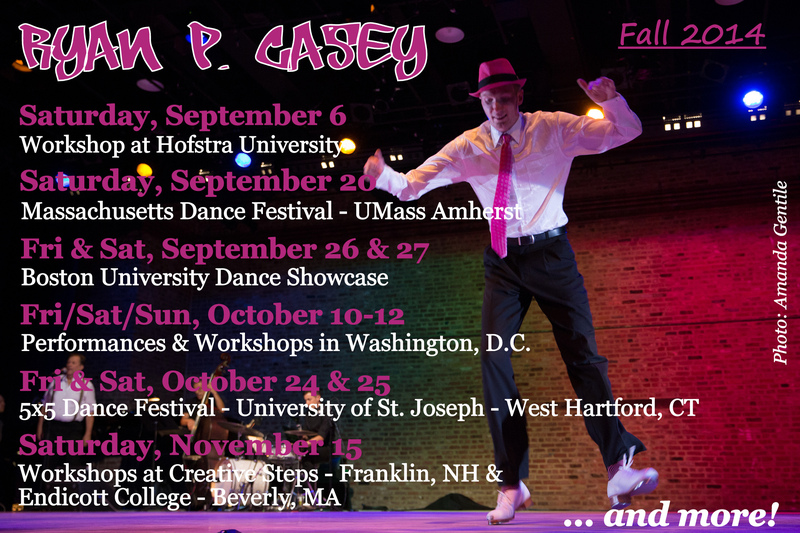 I’m happy to be returning for my fifth year in a row to the annual Massachusetts Dance Festival, which will be held at UMass Amherst on Saturday, September 20th. Join me for that night’s gala performance at 8 p.m. as I present a piece that incorporates both tap and cinematography! Tickets are available online now. The following weekend, I’ll be presenting a solo suite as part of the Boston University Faculty Dance Showcase. The performances are Friday & Saturday, September 25 & 26 at 8 p.m. in the beautiful BU Dance Theatre. This month, I begin teaching again at Boston University. My classes are open to the public, so please join, or pass the word along to someone who might want to! I teach Monday & Wednesday mornings/afternoons. Check the website for schedule, rates, and other information.